With the availability of guides, modern equipment and software today, it is not difficult to set up your own Home Recording Studio anymore. With a little knowledge regarding the essentials of a recording studio, you can soon start making music at the comfort of your own house. The location in the house in which the recording studio is would be of utmost importance. If you are setting up a studio only as a hobby, a medium-sized room will be quite enough. However, if you plan on further building it up in the future, it is better to pick a larger area. This is to give you the ability to add more room partitions, equipment, and accommodate more people when needed. Also, the recording studio location should ideally be far from any area in the house in which family members often frequent. This is to avoid catching unnecessary sounds inside the recording room. Moreover, this will also prevent disturbance to other people living in the house. 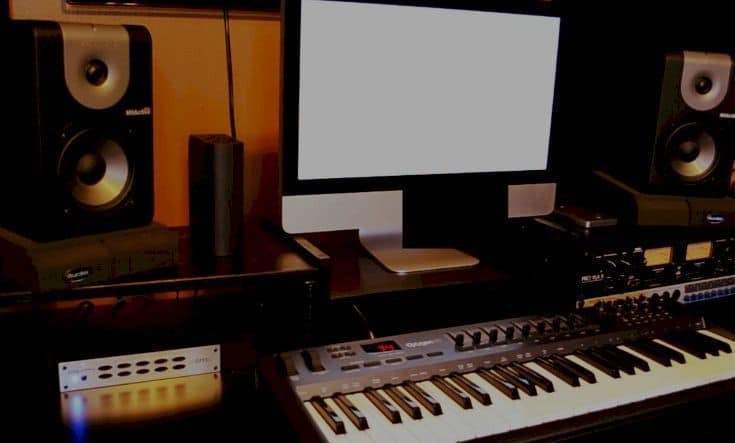 When needed, you can opt to have your studio professionally soundproofed. However, this may be a little pricey and time-consuming. Looking at professional recording studios can be quite overwhelming because of the size and number of their equipment. However, if you are just starting out, it is best to stay away from complicated gears until you have enough knowledge and experience regarding music recording. 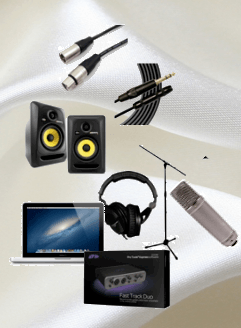 For now, it is best to first acquire the most essential recording equipment. The first equipment that you should buy is a computer. This will be your primary tool in mixing sounds and pretty much putting everything together. If you are always on the go, you can opt for a laptop. However, it is recommended that you go for a desktop whenever possible. Most modern computers today can easily handle the amount of work that audio recording requires. But, if possible, buy the highest amount of RAM to avoid overloading and sudden crashes. A high hard drive space will also enable you to install more recording software and save more audio files. Another important recording equipment is the audio interface. This device connects all other recording equipment such as mics and studio monitors to your computer. When choosing an audio interface, it is important to avoid those that are affordable but of subpar quality. This is because low-quality audio interface may hurt the sound you produce. If you are on a tight budget, always read the reviews first before you make your final choice. In combination with the computer and audio interface, you should also have a Digital Audio Workstation or DAW. This is a software that enables recording, editing, and mixing in the computer. Different DAWs have different features. Some provides you only with the basic editing and mixing tools while some may have additional options like adding effects or playing digital instruments. Depending on its features, different DAWs also have different prices. However, if you buy an audio interface, it should come with a free DAW. Of course, another vital element in the recording studio is the microphone. There are many kinds of mics that you will probably use in the future. But now as a beginner, you basically should have two: a dynamic mic and a condenser mic. A condenser mic will mainly be used in recording of vocals because it has higher sensitivity and is more responsive at higher frequencies. A dynamic mic on the other hand is more suitable for recording of instruments since it is responsive to low frequencies. If you want to further improve the quality of your voice recording, you should also consider buying a pop filter. This equipment filters out unpleasant vocal artifacts such as popping which is the sudden blast of air when pronouncing the letters B and P.
In audio editing and mixing, you will really need a good studio monitor. A studio monitor is a speaker that is especially designed for recording studios. While a consumer speaker produces enhanced audio, a studio monitor has a flatter frequency response and a more neutral, unaltered output. This characteristic will enable you to listen to your project at a raw state so you could easily identify what aspects need to be improved and what details should be retained. An alternative to the usual studio monitor is a studio headphone. However, while you can use it in the same capacity as a studio monitor, it is not always recommended. Studio headphones are much harder to mix on and project mixes that utilizes studio headphones generally don’t sound as good on speakers. However, as an upside, studio headphones are traditionally better than studio monitors when it comes to voiceover works. And in the course of your recording projects, you will need a bunch of different cables. As a starter, you will only need one long XLR cable for your microphone, and two short ones for the studio monitors. But before buying, make sure that your audio interface’s stereo output has built-in XLR connectors. Additionally, if you’re using studio headphones, you might also want to invest in headphone extension cables as studio headphones usually have short cords. If you are short on musical instruments or just want additional sound options, you might want to consider getting a MIDI keyboard controller. This will enable you to add virtual instruments to your tracks and even make your own music sheet.However, this is not at all necessary especially if you’re stacked in instruments, or is just planning to make straight audio recordings through the microphone. Lastly, if you are really serious about starting your own recording studio, you should not forget to buy a good mic stand. Not only will it be useful and convenient for the one recording vocals, it will also protect your microphone from sudden falls and breakage. It’s one less thing to worry about while you’re trying to work on your music. Technically, you do not need ear training software to start recording. However, what you may not realize is that a good musician’s ear is quite different from a good sound engineer’s ear. A musician’s ear recognizes audio aspects such as notes, chords, and intervals. On the other hand, a sound engineer’s ear is more concerned with recognizing bands of frequencies in order to produce a good output. For this reason, anear training software will help you produce a professional-sounding project. Of course, a good Home Recording Studio does not guarantee excellent audio results. It will just help you get to that, but in overall, the quality of the work depends mostly on the people involved in the recording and mixing.